Having a water softener system in your home is a great way to improve your quality of life, however it means maintaining your system to deliver quality to you each and every day. Step Saver, Inc. wants to completely alleviate the burden of maintaining appropriate salt levels in your softener, leaving you with only pure, quality water and complete peace of mind. The Step Saver system allows a direct connection from our salt delivery truck to your brine tank, without us ever entering your home or business. Our system measures your salt levels automatically and replenishes the exact amount of salt your tank needs to stay optimal. Step Saver is convenient, secure and often less than you currently pay for water softener salt in Minnesota! If you’re looking for the most convenient method of water softener salt delivery in Minnesota, Step Saver, Inc. is ready to open your eyes! 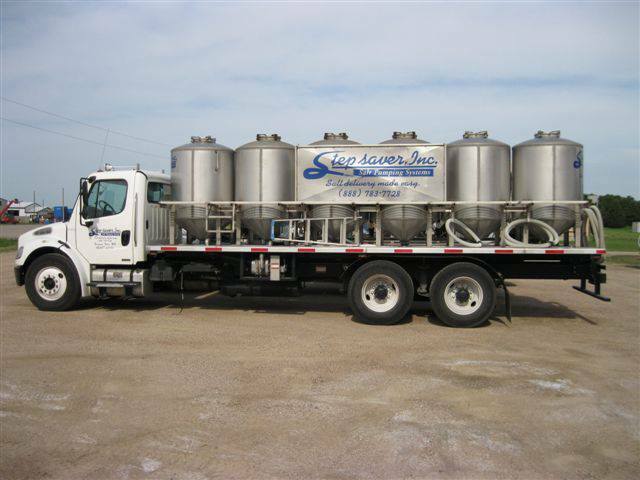 Step Saver also offers a full line of water softeners and R/O Systems to lease, rent to own, and for sale at very competitive prices! If you are planning on building or remodeling, or simply need a replacement water softener, let us help you select a unit that tailors to your needs! Our experts will consult your budget, your water needs and your ideal system preferences to recommend something that’s completely worthwhile for you. For the very best in water softener salt in Minnesota, Step Saver, Inc. is the clear choice. With decades of experience behind us and a staff of knowledgeable professionals who is completely in tune with your water softener’s needs, you can expect nothing short of optimal results with us on the job. For more information about our water softener products or to inquire about our array of services, please don’t hesitate to give us a call today at (507) 697-2057.